The reigning world champions are out of the competition, having finished bottom of Group F after a great effort by Korea Republic. In Group E, Brazil finished unbeaten and Switzerland joined them in the Round of 16. Group F provided some early morning drama in the 2018 FIFA World Cup and Group E saw pre-tournaments favorites continue on their journey. The World Cup has provided us with some shocking results but today's matches may be the benchmark of this competition. In Group F, Germany needed to beat Korea Republic to make the round of 16 while Sweden needed to beat Mexico and hope that South Korea toppled the current holders. Sweden's dreams came true in dramatic fashion. Mexico were not at the races today despite knowing that they could not rest on their laurels despite being at the top of Group F after two games. However, Carlos Vela could have given them the lead in the 17th minute when a quick break allowed the in-form Los Angeles FC man to have a go for goal but he curled his effort just wide of the far post. Sweden grew into the game after that and took advantage of Mexico's lack of urgency. It took a reflex save from Guillermo Ochoa in the 31st minute to stop Mikael Lustig from putting Sweden ahead as they towered over Mexico during a corner kick. 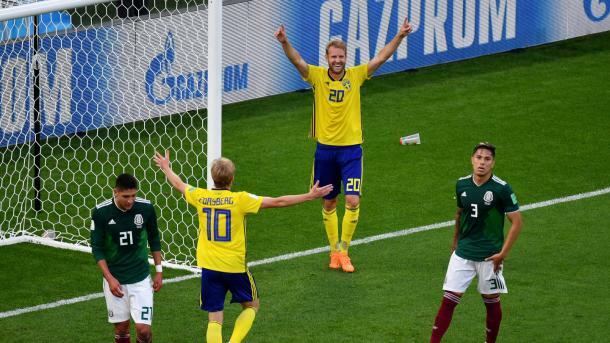 Mexico were just as lethargic in the second half as they were in the first and Sweden took advantage of that when they took the lead in the 50th minute. A good move led to Ludwig Augustinsson finishing low past Ochoa after the initial shot had been blocked and Sweden were ahead and looking for more. They had more ten minutes later when Marcus Berg was brought down inside the penalty area and VAR gave a penalty to Sweden. Captain Andreas Granqvist stepped up as he did in the first match for Sweden and converted the penalty, putting Sweden in pole position to qualify for the Round of 16. Edson Álvarez then had the ignominy of scoring an own goal in the 74th minute to finish off what had been an abysmal afternoon for Mexico and a delightful one for Sweden. The Mexicans had to wait until a few minutes after the final whistle to see if their poor performance had knocked them out of the World Cup but they breathed a huge sigh of relief as word reached them of Germany's demise. Germany knew that nothing short of a win today would be good enough and Joachim Löw made changes to the side that beat Sweden to try and achieve that result. Instead, it was the South Koreans who produced the first big chance of the game as Son Heungmin sent in a 19th minute free-kick that Manuel Neuer did not gather well. Fortunately for the Germans, Neuer recovered quickly enough to punch the ball away before anyone else could get to the rebound. Germany did create chances of their own in the first half as well, with Mats Hummels coming closest in the 39th minute after South Korea did not deal well with a corner kick from Germany but the FC Bayern Munich man could not finish from close range. In the second half, Germany seemed to try and push the tempo a little bit more and Leon Goretzka should have put them ahead in the 49th minute when he was left wide open to meet a cross inside the penalty area but Jo Hyeonwoo made a great save to deny the German No. 14. 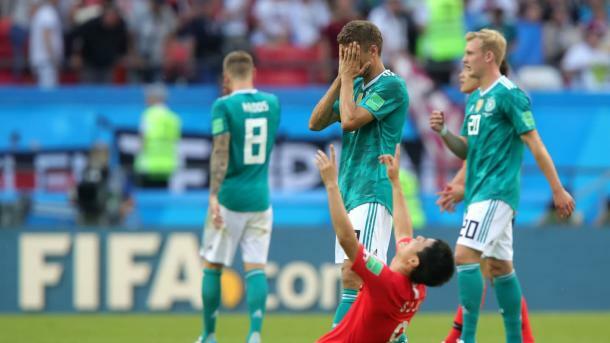 As time wore on and news from the other game filtered in, Germany seemed to lose hope while South Korea gained more self-belief. With six minutes of added time left in the game, it was the South Koreans who found the opening goal as Kim Younggwon capitalized on a mistake by the Germans during a late corner for South Korea and finished from close range. With seconds left to play and even Neuer spending time in the opposition half as Germany tried to fight their way back into this group, Son raced onto a long ball towards goal after South Korea had won the ball back and finished into an empty net, sending their fans in Russia and across the globe into delirious joy. This World Cup has produced shock result after shock result but Germany finishing bottom of the group and not advancing to the knock out stages for the first time in decades will surely go down as one of the most surprising results in this tournament. Sweden, who seemed completely bereft after their late loss to Germany will now head into the Round of 16 as group winners and coming off a great performance against now second-placed Mexico. Brazil and Switzerland needed at least a point from their respective games against Serbia and Costa Rica to make the Round of 16 and they both did enough to book their places into the next round. Brazil looked to start off strongly against Serbia and leave no question about the way this game was going to go, even though they did suffer an early setback as Marcelo exited early with an injury. Neymar almost put Brazil ahead in the 25th minute after some quick combination play with Gabriel Jesus but his shot went wide form a tight angle. The South Americans did end up taking the lead in the 36th minute as Philippe Coutinho picked out Paulinho's late run from midfield and the FC Barcelona man lobbed the goalkeeper with a lovely finish. Brazil kept pushing for a second but it was Serbia that had the next big chance in the game in the 61st minute. 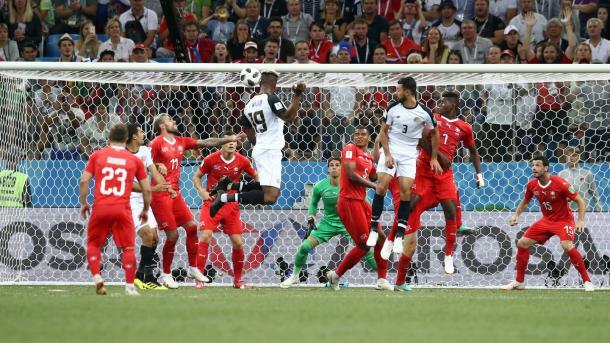 Aleksandar Mitrović's header was first blocked by Allison Becker and then the rebound came off of the Serbian striker and a Brazilian defender before rolling away to safety. That miss by Mitrović was punished by Brazil seven minutes later when Thiago Silva met Neymar's corner kick at the near post and nodded home from close range. That was enough for Brazil and they saw out the rest of the game comfortably. Switzerland came into their game against Costa Rica needing only a point but they were made to work for that point by the Costa Ricans. Blerim Džemaili put the Swiss ahead in the 31st minute but it came after Yann Sommer had made a huge save on Celso Borges and Daniel Colindres had hit the crossbar with a stunning effort earlier on in the match. Costa Rica failed to deal with a cross into their own area and the ball fell kindly to Džemaili who thumped the ball past Keylor Navas. Kendall Waston made things interesting again in the 56th minute as he outjumped his marker during a corner kick and powered home a header to equalize for Costa Rica. Josip Drmić then saw his header hit the crossbar in the 78th minute but he made up for that miss with a fine finish in the 88th minute. Costa Rica did provide some very late drama as Bryan Ruiz' penalty bounced off the crossbar and off of Sommer before rattling into the goal. It gave Costa Rica something to take home with them but their journey in the World Cup reached its conclusion today. Brazil will face off against Mexico in a few days time while Switzerland will battle Sweden in the other Round of 16 match on Monday, July 2nd.